To celebrate the opening of new Caribbean food stall 'Jeffro`s Wingz an Tingz' and 'That Beer Place', Chester Market will be open until 8pm on Friday 12 October for a sneak peak of the latest arrivals. 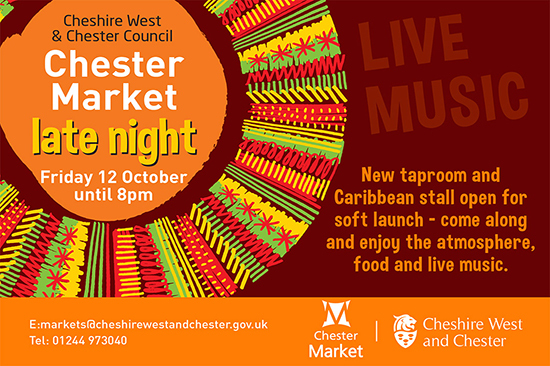 Councillor Brian Clarke, Cabinet Member, Economic Development and Infrastructure said: “Chester Market will be open until 8pm on Friday with live music as we welcome Caribbean food and a wide selection of craft beers. “The Market is expecting three more traders next month and has a waiting of people wanting a stall which is great news. The Market has welcomed over half a million people this year“. Jeffro`s Wingz an Tingz will be offering tastes of the Caribbean including wingz, curried mutton with pineapple punch and Guinness punch. That Beer Place is a new Independent Bottle shop and Taproom in the Market, offering a huge selection of craft beers, real ale, small batch gin, wine and cider to drink in or take home. The Market is now offering a truly international flavour with Artisan, American streetfood, Italian, British, Thai, Bistro, Deli and Italian Pizzeria. Visit: chester.market for details about all of the traders at the Market.